go on, play with your food! ← How does your garden grow? I love the tastes of summer. One of the easiest things to do is to grill some fish, chicken or burgers for dinner. But what do you make to accompany that protein? We try to follow the “eat from the rainbow” rule. You know what that is, right? Basically, try to include foods of different colors. Greens, yellows, reds, oranges, purples, blues. An easy side dish this time of year is coleslaw. But just not any slaw will do! 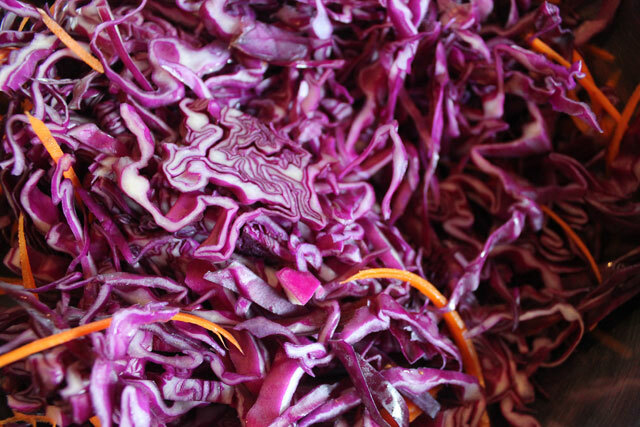 The Red Cabbage (which we call purple in our house because, well, it is purple, isn’t it? ) is filled with all kinds of good antioxidants which are supposedly good for you. Anyway, this takes no time and is an easy crowd pleaser. Best done the night before, but very edible on the day of if you wish. The dressing for this salad is ripe for riffing! Most recipes call for a cup of mayonnaise, 2 tablespoons of sugar and 2 tablespoons of vinegar as a base. I make my dressing in the blender. I use about a cup of mayonnaise then add a healthy dose of whatever flavored vinegar I have in the house (like black cherry!) then I add fresh chives from the garden and salt, pepper, sometimes some honey mustard and celery seeds. I blend those ingredients in my blend on the sauces setting, pour it over the cabbage/carrot mixture, mix in really well, and let it sit for a few hours. Pretty simple, and seriously delicious! 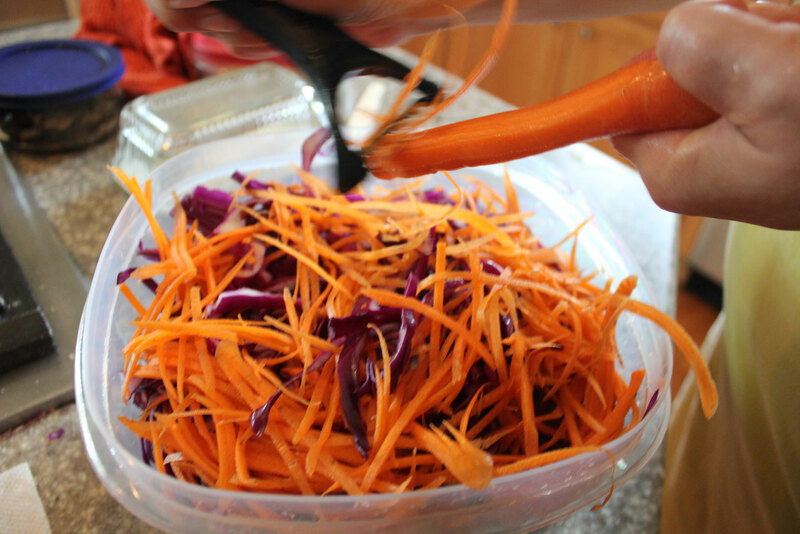 This entry was posted in Salads, side dish, Veggie Heaven and tagged carrots, coleslaw, red cabbage. Bookmark the permalink. Yummy recipe, can’t wait to give it a try! Breakfast Muffins — oh YEAH!